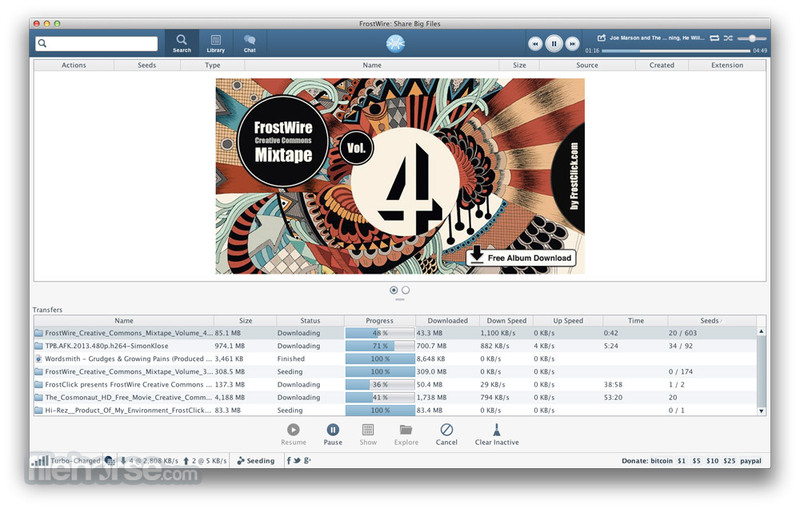 FrostWire for Mac is a free, fully featured BitTorrent Client and Internet Downloader with an integrated Media Player and Media Library. It also features a built-in search of multiple torrent trackers and websites, download preview and file format selection. Now with a FrostWire Plus for Android available free from frostwire.com/android you can also take all the desktop functionality on the go. Hide your real IP address and protect your privacy while online! Check out HMA! Pro VPN for Mac! 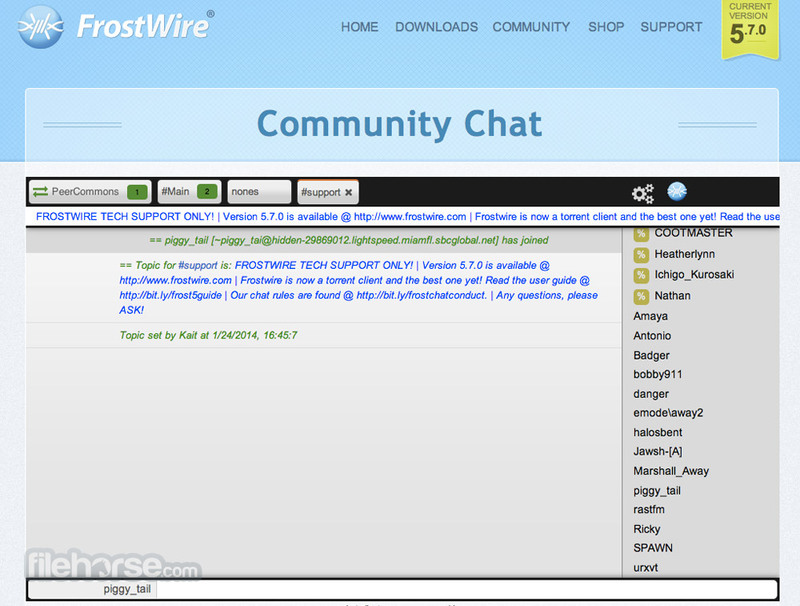 FrostWire was first released as a fork of LimeWire over 10 years ago and has evolved tremendously to become one of the most popular free and open source file sharing programs in the world. Just type your keyword and go! 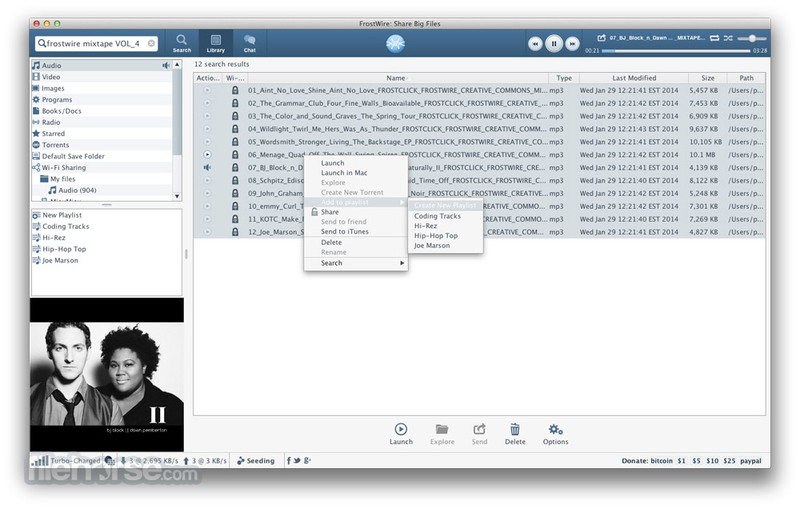 FrostWire connects to many different torrent search engines and websites, including YouTube, to find the files you are looking for - all in one place. Download any file with one click. On desktop, you can even hand-pick single files from torrent transfers or preview files before you download. Easily access, browse and play all your media in one place. Create and share playlists. Whether you want to transfer files to your phone, share them with just your friends over local wi-fi or create a torrent to share with the entire world. Browse through FrostWire's favorite featured artists sharing their music with you under Creative Commons or check out thousands of free downloads and content reviews from FrostClick.com. Note: Requires Java and 64-bit processor.